We are excited to feature Gert Sylvest from Hyperledger Premier Member Tradeshift in this month’s community spotlight. Gert Sylvest, is the Co-founder and SVP of Global Network Strategy of Tradeshift. He is a leader in blockchain serving on the Hyperledger Governing Board and as GM of the Tradeshift Frontiers initiative. Tradeshift joined Hyperledger as they saw blockchain as a transformative technology for bringing trust and transparency to global supply chain management and business ecommerce. 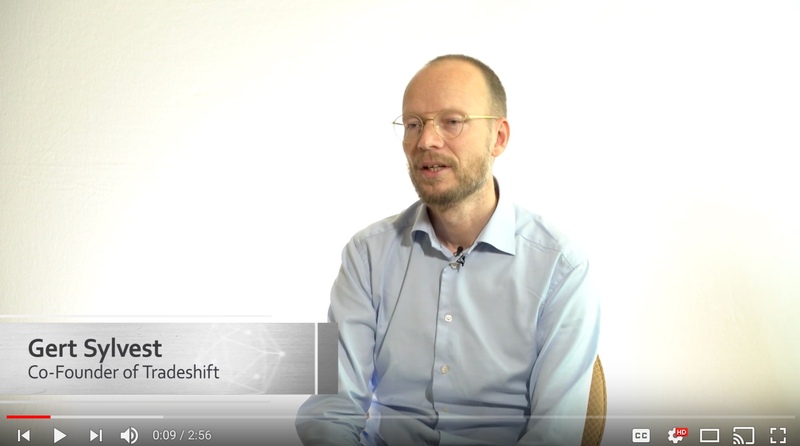 In this video interview, Gert shares his thoughts on the modular approach to blockchain, how it’s transforming the world, and the importance of sharing use cases to help bring the technology forward. Founded in 2010 in Silicon Valley, Tradeshift is a B2B company with a focus on trust and transparency of transactions by connecting supply chains and bringing them into the cloud environment. They’re exploring use cases from cross-border financing scenarios, trust, track and trace and supply chain management, and see business blockchain technologies playing a role across all of these.